THOMASTOWN, IRELAND - It's unlikely you've ever heard of Thomastown, Ireland. It's a sleepy little village in the southeastern section of the country, and is notable for one reason in particular - it's home to the magnificently gracious Mount Juliet Estate, a 1,500 acre haven in County Kilkenny that is the latest addition to the Conrad family of luxury hotels. The resort is situated some 75 miles southwest of Dublin, and is one of the most desirable vacation locations in Ireland, if not all of Europe. Just a few short weeks ago, most of the world's finest golfers were exposed to the property for the first time, as the American Express Championships were contested, ultimately won by Tiger Woods. A world class golf course is the first prerequisite in landing an event of this magnitude. Mount Juliet is the only Jack Nicklaus signature course in the country, and was three times the host of the Irish Open shortly after the course debuted in 1991. It's often said that a tournament venue can be defined by its role of champions. The triumvirate of Nick Faldo, recent Ryder Cup hero Bernhard Langer and victorious Ryder Cup captain Sam Torrance were all winners of the national open at Mount Juliet in the mid 90s. The fact that these three champions have combined for more than 100 professional victories around the world, including five Major championships and thirty Ryder Cup appearances between them provide irrefutable proof that this course is a championship test of the first order. The course is more than 7,100 yards of rolling, tree lined terrain, with diabolical pins placed on heavily contoured greens, and a virulent strain of rough in which locating and then extricating one's golf ball are a two part puzzle. The pros in attendance made it look easy, as they so often do. Once the rough is sheared down to the resort level that most recreational players demand, players will encounter a delightfully scenic track that's best attempted from 6,700 or even 6,300 yards. There are plenty of highlights to be found in this bucolic parkland setting, but the 3rd, an elevated par 3 over water, is among the most memorable holes on the property. The following hole is no slouch either, a thoughtful, 390 yard par 4 with a constricted fairway and narrow green flanked by a menacing lake. The 10th hole is a risk/reward par 5 that features a copse of trees bisecting the fairway and a daunting series of bunkers fronting the green. The final hole is a beauty as well, but demanding to the extreme, a 450 yard par four from the middle markers, with water guarding the entire left side of the fairway. It's a stirring conclusion to a strong parkland golf course. Of course, most American golf nuts aren't disposed to head to Ireland to tackle parkland courses, particularly ones of recent vintage. 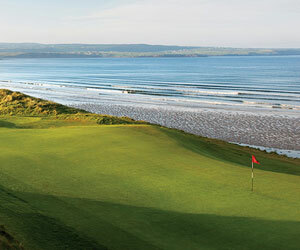 It's the classic links of Ireland; Ballybunion, Royal County Down, Lahinch and the like that stir the imagination of those who play parkland style at home. Fortunately, there is much more to recommend at Mount Juliet than just a fine golf course. Begin with the accommodations themselves. The Mount Juliet House itself is a handsome Georgian mansion with 32 individually appointed rooms. Making the field at a WGC event requires a great single mindedness of purpose in addition to otherworldly talent, so the pros probably didn't take notice of niceties like leaded windows, claw footed tubs, and heated towel racks in the bathrooms. Outside of the main house there are sixteen other recently refurbished rooms at Hunter's Yard, and eleven Rose Garden Suites, each with two bedrooms and full kitchen, ideal for the Europeans in the tournament field who arrived "en famille." The Mount Juliet Spa is a decade younger than the golf course, unveiled in 2001. A wide range of both traditional and avant garde services are available in five separate treatment rooms, so even when scores were high and competitors stressed out at the recent World Championship event, presumably there wasn't too long a wait for a massage table. There is also an indoor heated swimming pool complete with waterfall, as well as a sauna and steam room. The equestrian program is another focal point of life on the estate. There are 15 horses in the stables, each with different strengths and specialties. Besides trail riding, show jumping, cross country and lessons, guests of the resort can request to observe a mare foaling, and be woken to view this extraordinary experience by the staff no matter what the hour. Add in the excellent salmon and trout fishing at the nearby King's River and River Nore, target shooting, tennis, biking and archery, and it's easy to see why the championship golf course, though impressive in it's own right, is just a piece of the overall package. Visitors also enjoy a delightful 18 hole par 53 putting course, complete with subtle contours, ridges, bunkers and water hazards. Word is that putting maestro Brad Faxon posted the lowest score during the informal competitions held during the WGC event, but even he finished one over par for the round, taking 54 stokes to negotiate the terrain. At the end of the day one can dine formally in the main house at the Lady Helen Dining Room, featuring expansive views of the estate that are as impressive as the traditional cuisine. Less decorous but equally satisfying dining can be found at either Kendals or The President's Bar, located just a short walk from the main house in the Hunters Yard area of the estate. It would be great to be a hotshot Tour pro, and earn an invitation to multi-million dollar tournaments like the WGC event at Mount Juliet. But for the legions who can't hope to challenge par, visiting Mount Juliet is greater still. For it's only those visitors who have time to indulge in all that's available off the golf course that can truly appreciate the scope and quality of one of Ireland's finest holiday destinations. Mount Juliet is one of the best courses I have played and I am playing Mount Juliet again today at the Summer Series.